So first of all, thanks to my fellow (and much more experienced) expert @rappen who pointed out that this could potentially mess up your solutions. ALWAYS BACK UP YOUR SOLUTIONS FIRST! Also, only use this for the display name on the sections, if you change the section name it will change for the base language as well. So we all know that translations in #MSDYN365 can be a pain unless you're using tools (a big shout-out to http://www.xrmtoolbox.com/ ). But did you know that there's a simple way to translate section and category labels? 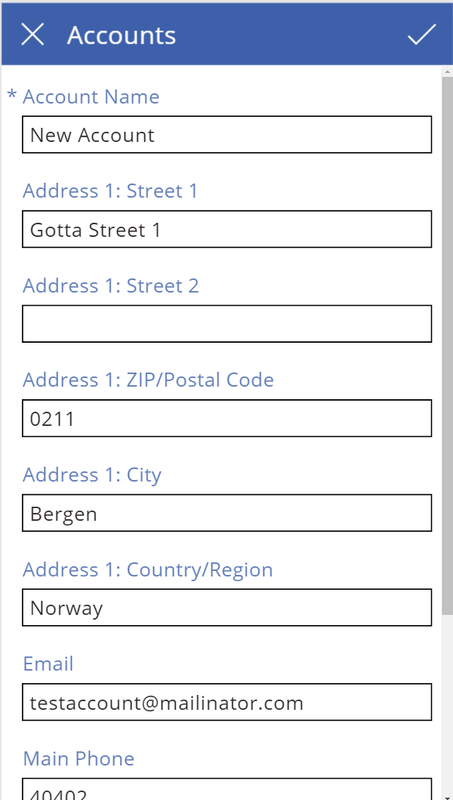 4) Navigate to the form you want, and you'll see all the secondary language names. You can then edit the label, save and publish. Now the sections on your forms will have translations for all the languages you repeat this for. This isn't anything revolutionary, but if you're doing this as a one-off you might consider it instead of installing third party solutions or taking the chance and editing the XML. 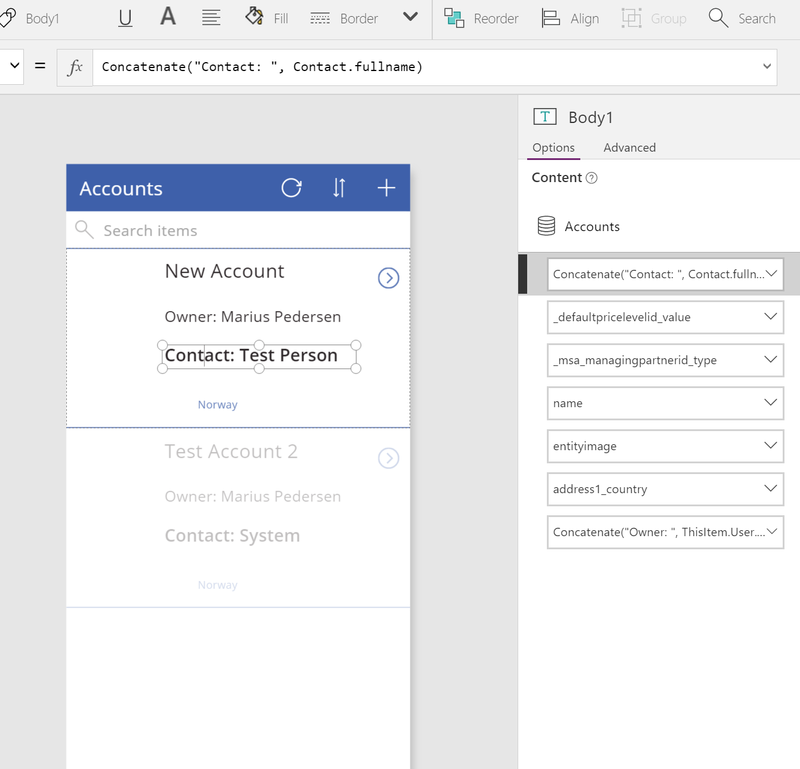 PowerApps is a relatively new feature to the Office365 portfolio which allows advanced users to create their own apps which can be used on mobile (and desktop) platforms to perform daily tasks. It is a great tool for creating those small functions you usually have to book a developer for a few hours/days, and is ready for authentication, authorization, and distribution right out of the box. 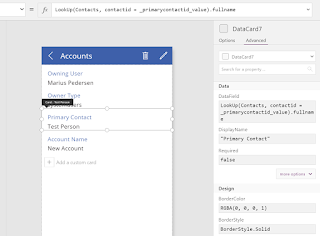 PowerApps comes with the ability to connect to a wide array of sources to collect and manipulate data, and today I'm going to demonstrate how to connect with MSDYN365:CRM and how to use connect with related records. 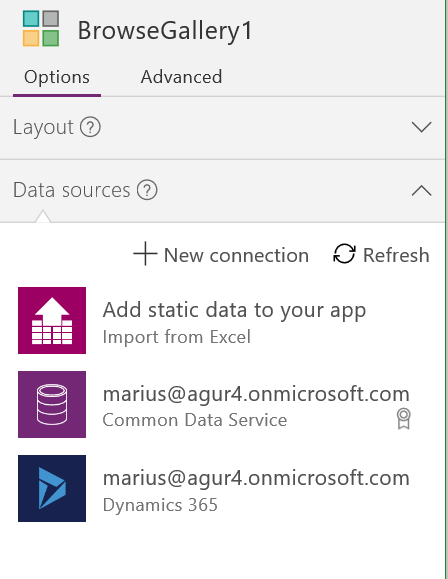 What I'm doing is connecting to the MSDYN365 suggestion, and I'm going to add 3 tables (entities) to my data source list; Accounts, Contacts and Users (systemusers). Once that's done I'm going to add a new screen with the browse template. This will give me the option to search and display records from the chosen data source. Now, from the right hand side, choose the advanced tab and select your Gallery component from the dropdown list. Next through the Home tab on the top toolbar select "Items" from the property dropdown box. We're going to do some drastic changes to the formula used to collect data, but first a little insight. 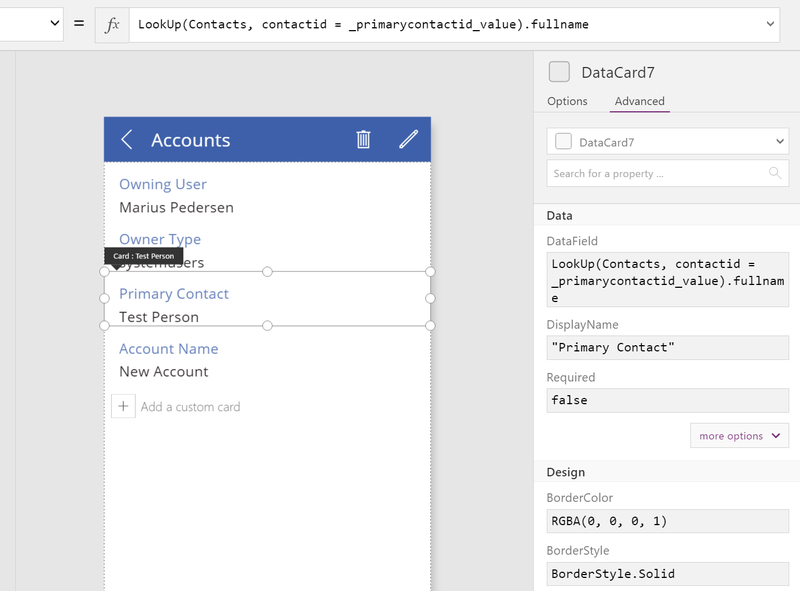 When a function is run/validated in powerapps it returns the result set to the parent function (or context, whatever you'd like to call it). This means that we can build an advanced data source or query by nesting functions inside each other, and end up with a pretty good set of data to play with. Now this might seem a little frightening at first, but I'll go through it step by step and you'll see how I thought through it. Remember the part about nesting functions that I mentioned above? Well that's how I start building a function, by nesting backwards. I want a collection of accounts, but I also want to add the primary contact and the account owner (I'm not checking for teams, I'm just assuming that all accounts are owned by users. This is just a quick demo). That means I'll have to use a function to join those sources. 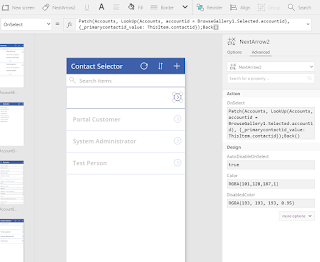 A quick search online says that I can use AddColumns to do joins in a PowerApp formula, and thanks to the built in intellisense it's easy to create the formula required. This means that I've nested the Users entity underneath the "User" column alias, and the Contacts entity underneath the "Contact" column alias. So now that we have a decent-ish looking gallery we want to do some modifications to our details and edit forms. 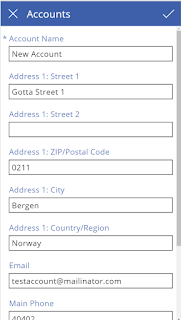 There isn't really any magic to this, you simply add and remove the data fields that you want. There are however two things I would like to point out so that you don't walk into the sweet honey traps. We use the item from the gallery, ie. BrowseGallery1.Selected. This will work perfectly fine as long as you don't try to update any other fields than the main account fields. However, you will get an error in the PowerApp user interface because the data source chosen for the details form is not the same data source as you have in your gallery. The upside is that you don't have to do a new query to get the account data, but on the downside you will have to live with a warning sign that comes with not following the best practices. The positive thing about this is that we're now 100% compliant with the best practices, but we now don't have direct access to the sub-components, and we're doing an additional query to CRM for a lookup. Luckily, this lookup is very cheap because we're getting 1 entity based on the Guid, and I'll be picking this one just so we can demonstrate how to do a lookup inside a field. So now that I've done a very small amount of customization my detail form looks like this. So now we have a complete app that can search for Accounts, display related record information, and finally edit the fields and set a new primary contact. This should work just as well for all related records, but now you have a pretty good example to start out with. So as we've seen not everything in PowerApps is just point-and-click, but you don't have to be an advanced developer to find out this stuff on your own. 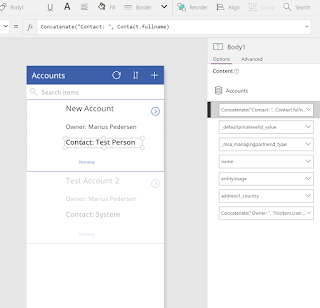 The documentation for powerapps is decent, so you'll find plenty of examples you can experiment with on your own. 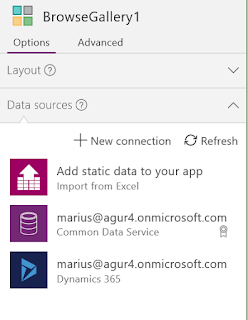 What I find very exciting is that not only can I create these simple apps very fast, I can also distribute them to other users in my organization so that it will be available from the https://home.dynamics.com menu. I've added a copy of the powerapp to to my public google drive so you can download it and use it as you want (TestAccounts.msapp). All you have to do is to go to the "Content" tab and add the data sources, you'll need "Accounts", "Contacts" and "Users", and then you're ready to go.